Oppan Gangnam Style! The newest and zaniest dance craze ever to have hit American shores is a catchy Korean pop song released this past July by South Korean rapper and hip-hop artist PSY. The music video quickly became viral due to its highly addictive beat and unusual dance choreography. After debuting at #1 on the Gaon Singles chart in South Korea, the music video for Gangnam Style, posted on Youtube, garnered enough views to be named the most viewed K-pop song on the popular video-sharing website. 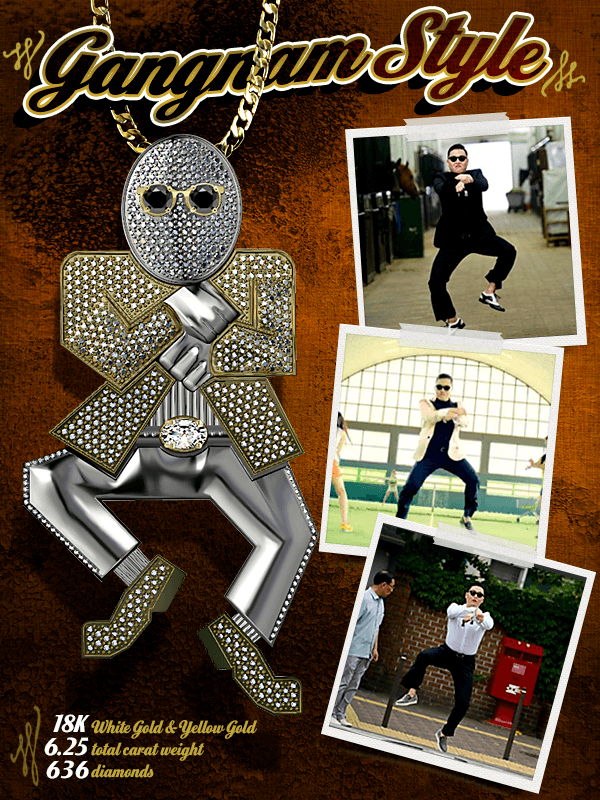 One celebrity was so overcome with Gangnam Style fever that he commissioned Brilliance to create a custom pendant in honor of the wacky dance. This diamond pendant, in the shape of a man doing the signature horse-riding Gangnam Style dance, contains over 600 diamonds for a total of 6 1/4 carat total weight set in 18k white and yellow gold. The Gangnam inspired diamond pendant is now available for purchase through our website.